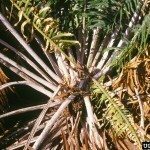 I have a male Sago Palm... every year he produces his cone. Last year it was 2 and so far this year I've counted 7. Is this normal? Why would he produce so many? As a mature plant, this is healthy. This indicates that it is well taken care of and very happy.